It's not uncommon for companies to contact bloggers and offer samples of their products, hoping writers like me will enjoy them and write about them. Most often I decline because the products aren't something I'm personally interested in, or they just aren't appropriate for this blog. 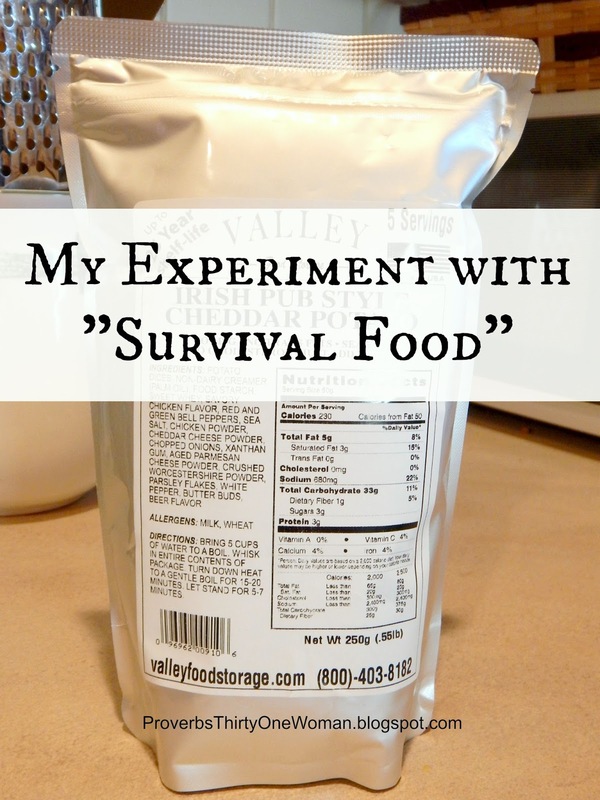 But recently, a company that makes freeze dried "survival food" contacted me. I was intrigued. This is not the sort of product I have hanging around. Yet...did you know the U.S. Federal government advises all citizens to have food and water on hand in case of emergency? (In fact, they have an entire website devoted to helping us do this.) So, this time I said yes. The most common way to build up an emergency supply of food is simply to buy extra of shelf stable foods you're already purchasing. These foods generally last at least a year in your pantry, but you should still eat and replace them regularly. If the idea of rotating food seems like a pain, or if you just want some light weight food you could easily take along in an evacuation (or while camping), freeze dried food is a good option. It can taste really awful. Really. Awful. It can spoil before the manufacturer claims it will. It's usually full of nasty, chemically ingredients. Ugh. The owners were inspired to begin their business after buying some supposedly long term freeze dried food that went rancid a few years later. They determined the oils in the food were to blame and thought they could create something better than what was already on the market. Their food has ingredient lists you can read! This is huge! No artificial preservatives, sweeteners, or MSG. Their food is GMO-free. Again, this is huge. They use sea salt, not processed salt, which is linked to autoimmune disorders. 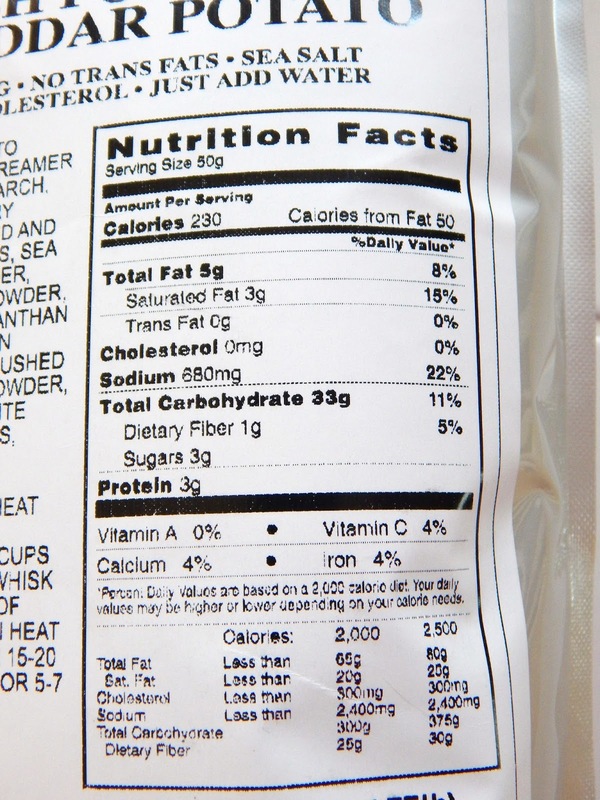 There are no trans fats or cholesterol in their food. They have gluten-free options, which is a big deal since so many freeze dried foods contain pasta or other wheat products. They also have dairy-free options. Each bag is sealed in a hefty Mylar bag - the air removed with nitrogen. 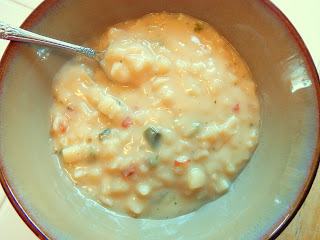 The first meal I tried was Irish Pub Cheddar Potato Soup. It, like all of the samples Valley Food Storage sent me, was packaged in a tough Mylar bag. The ingredient list was easy to read, as was the nutritional information and cooking instructions. Following those instructions, I measured out several cups of water, added the contents of the bag (I had to cut the bag open; the packaging was too tough for me to tear), and let it boil gently. The instructions didn't say to stir the mixture, but I did stir it periodically to prevent it from sticking to the pan. In 20 minutes, the cooking time was up and I removed the mixture from the pan. It didn't look at all like the photo of the food on the website. But that was about to change. 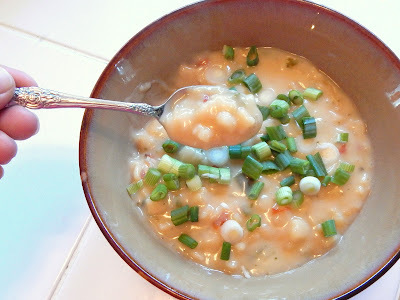 The finished soup, without my green onion garnish. Next, I let the food sit in the pan for seven minutes, as instructed on the packaging. Actually, I let it sit longer than that, because my husband was late for dinner. But by the time I spooned the soup into bowls and served it, it was thick and delicious-looking, just like on the Valley Food Storage website. To add some extra appeal, I grabbed some green onions (scallions) I had in the garden, chopped them, and sprinkled them on top. And how did it taste? 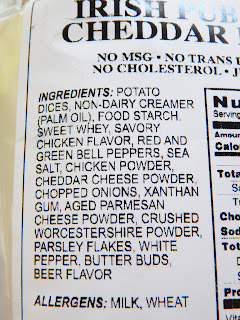 It didn't taste chemically or overly salty, like so many freeze dried foods. It didn't taste like boxed grocery store food, even. It actually tasted home made! 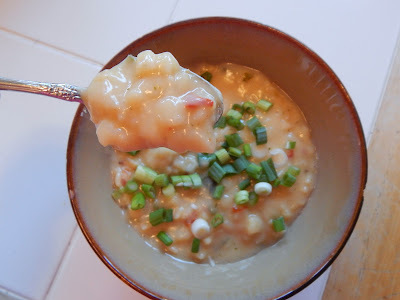 We were really impressed and both my husband and I agree that we'd eat that meal any time. The finished soup with my green onion garnish. My only (small) gripe? The package said it contained five servings, but if you're eating the soup by itself, with nothing else, I think it will feed about 3 people with modest appetites. But then again, because of all the cheese and potatoes in this meal, it's fairly high calorie (perhaps a good thing in an emergency situation). It was also extremely filling. 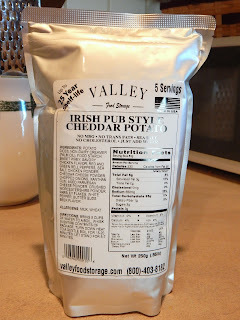 We also ate other Valley Food Storage offerings, and thought they were excellent, too...All rather a shock to me, since I thought I was agreeing to try food that would be something I'd only want to eat if I was starving. And I don't think their prices are bad, either. 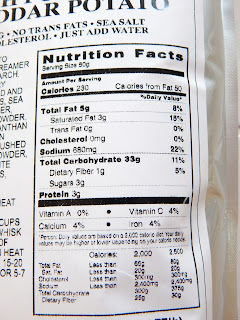 For example, a 30 day supply of food is $1.87 per serving (although, again, those servings might be smallish). 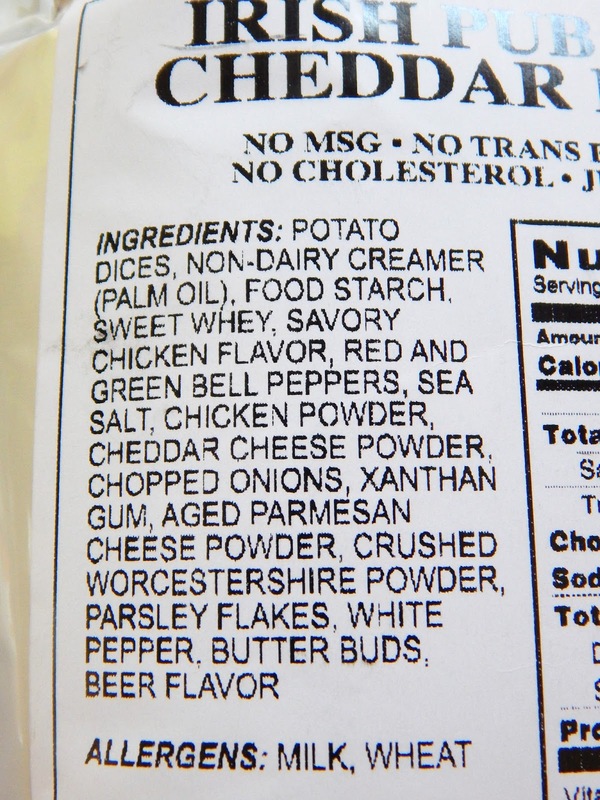 A single packet of Irish Pub Cheddar Potato Soup is $11.95; that may seem like a lot, but it's not a bad price for a freeze dried meal. Even the cheap, chemical laden, yucky tasting types sold for camping cost at least that, and often more. So, if you're considering buying freeze dried food for emergencies, I highly recommend Valley Food Storage's stuff. Currently, you can visit their website and request a free sample. You can also get 10% off anything on their site by using the coupon code Proverbs 31. Be sure to check back in with me and tell us all what you think!